Yesterday both of us woke up with a stomach bug which kept us resting, sleeping and/or watching TV all day. Today we woke up feeling much better but decided to spend the day at home taking it “easy”. In the afternoon taking it easy turned into organizing the home office. 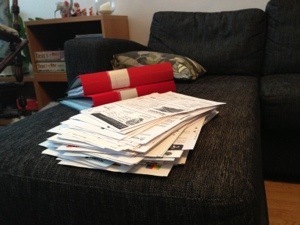 I cleaned out all paperwork and sorted them into the correct binder. I did this both for our private paperwork as well as for our business. I also cleaned out the binders from paperwork we no longer need. The best part is that I emptied the binders of more paperwork than I put in! Now the fun part of paper goes into shredder is left. I was very satisfied with myself but of course I didn’t stop there… I figured when at home because I’m not feeling 100% I might as well use that time to clean the closet in the home office as well instead of having to do it someday when I’m feeling fantastic and want to do more fun things. Everything got sorted, a lot thrown away and the rest put back into the closet again… I think we were more effective than usual because suddenly we have an empty shelf! 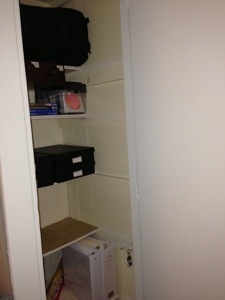 I love cleaning and organizing when it’s this effective! Isn’t it nice to throw out a whole bunch of old crap like that! 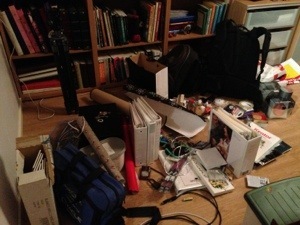 AND isn’t it amazing how much crap one can COLLECT in a short space of time even without intending to! I hope ur both feeling better now. Oh, and isn’t it amazing how much better you feel in a clean house!